Celebrate the Taste for Sour. What’s your favourite sour ingredient? a sharp cooking apple perhaps; or maybe some strong blue cheese or a big dollop of natural yoghurt; a hunk of homemade sourdough bread or some sauerkraut perhaps? This post celebrates our passion for all things sour. As one of our five essential tastes, sour ingredients add real depth and brightness to your cooking and we eat and enjoy these sour notes all the time. Where would we be without sweet and sour chicken; a Bramley apple pie or a good plate of strong, mature cheese and biscuits? Firstly, fruits that are naturally sour, such as cooking apples, lemon, tomatillos and tamarind. They provide essential sharpness to dishes around the world, balancing the sweetness or saltiness of a dish. For example, tamarind is a favourite ingredient in Asian cooking; tomatillos add depth to Mexican cuisine and lemon adds an essential tang to dishes everywhere. These foods are created by careful fermentation, using natural, good bacteria to create delicious tastes, using salt, natural yeasts and patience. Making bread with a natural, sourdough ‘leaven’ is great for three reasons in my view. Firstly, you get a really good depth of flavour to the loaf – more interesting than a traditional, yeasted loaf. Secondly, it’s a very healthy way to eat bread, because the longer process of creating the starter and leaving the dough to prove means the grain breaks down more so is more digestible, and thirdly, there’s just something amazing about creating a loaf from just flour and water. There’s a whole bunch of cookbooks to get you into making sourdough – we use ones by Andrew Whitely and Chad Robertson. Having begun as a way of making the most of the harvest before the advent of technology and global food production, fermented foods are once again in vogue. There’s been a huge rise in the availability of sourdough bread, and dishes like kimchi (Korea’s national dish of fermented radish or other vegetables) have also seen a big increase in popularity. I’m a big fan of the German favourite – sauerkraut, especially homemade sauerkraut made with just red cabbage and salt. To make a jar of sauerkraut, finely slice and chop some red or white cabbage and add 2 teaspoons salt per 500g of cabbage. Squeeze and lightly pound the cabbage in a big bowl, until you can squeeze juice out of a handful of cabbage. Pack into jars, press down and then weigh down to ensure the cabbage is covered in juice. Seal and leave for a couple of weeks to ferment. Once you start using it, keep it in the fridge. It’s great with eggs, cheese and bacon. Fermented foods are great because they provide the kick of sour flavour, and the added benefit of high nutritional value (as long as you stick to home made or ‘real’ foods and not the ‘pretend’ foods you find in supermarkets – see my footnote). I’ve started growing my own tomatillos as they’re not yet a common fruit to buy. They’re really easy to grow though and the plants are very prolific. Just a few tomatillo plants will give you at least a couple of kilos of fruit. The fruits are a mix of sweet and sour. You can use them raw in a salad to add a bit of sour crunch, but usually they’re cooked (roasted or simmered), and made into the classic Salsa Verde. Here’s a recipe from one of my favourite cookery books “Mexican Cooking made easy” – a great book we bought on a trip to Arizona. All the recipes are written in both English and Spanish so it has a real authenticity to it! 450g fresh tomatillos, 2 green chilies, 1/2 cup chopped onion, 2 TBsp chopped coriander, 1 Tbsp oil, 1/4 tsp salt. Remove the papery husks from the tomatillos and rinse. Place them in a pan with 1/2 cup of water. Bring to the boil then simmer for 10 minutes, (they’ll cook down very quickly). Remove the tomatillos, but retain the liquid. Remove the stems, then put all the ingredients, including the retained liquid, into a blender and blend until smooth. Use the sauce over chicken enchiladas, or as an alternative to a tomato salsa. So celebrate your taste for sour and let me know if you have favourite sour ingredients. * Footnote: A supermarket sourdough nearly always contains added yeast (as well as other ingredients). 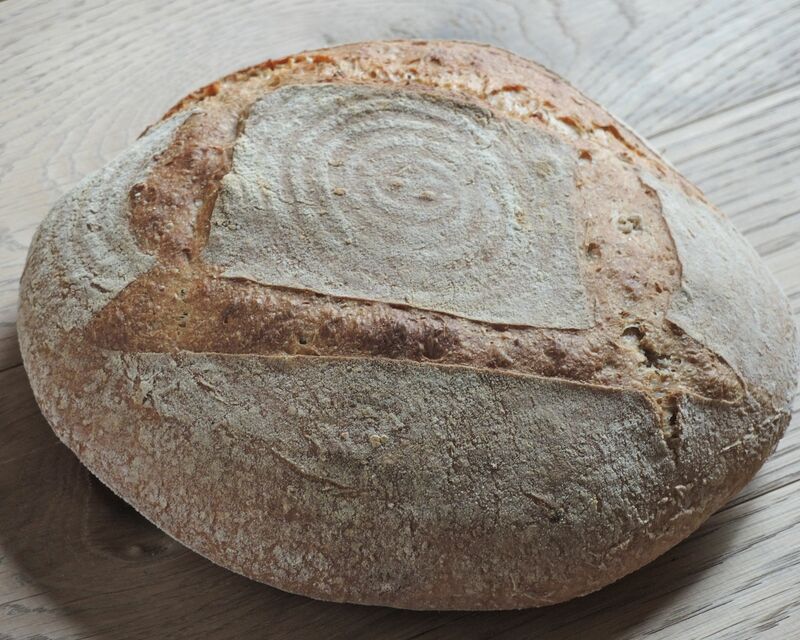 The whole point about sourdough is that it’s made with just flour and water, using time for the flour and water to develop into a natural ‘leaven’. Adding a bit of dried sourdough powder to an ordinary loaf does not make it a sourdough loaf – see http://www.sustainweb.org/realbread/ for lots more information. And another one to watch is supermarket ‘mature’ cheddar. It’s often made with additives that give the flavour of a mature cheddar without the requirement for the cheese to actually mature at all, so choose carefully. A bit of research into genuine, high quality cheddar is all you need to do to avoid the processed and poor quality supermarket imposters. Posted on October 11, 2015 by Sarah at Seasoning Works. This entry was posted in seasoning, tastes. Bookmark the permalink. This tomatillo salsa verde looks incredible. Why don’t shops sell tomatillos? Is it just because they’re not a fashionable fruit? And i’m definitely trying this sauerkraut recipe. Especially as the red cabbage glut is just around the corner!